Your landscaping can be stylish and fun without negating the usefulness of the yard as a whole. With the right elements throughout your entire property, you’re more than welcome to enjoy the benefits of having a beautifully landscaped yard without the hassle of having to worry about whether or not it fits in with the latest 2015 trends. And the trending items we mentioned for 2014 are also still popular, so check out our post from last year for some tips. House numbers have a function but they don’t have to be boring. They can be as creative as possible with a little imagination. Not only does this play up the front of your home a bit more, but it gives it some personality. In the past, house numbers were done out of necessity; now they are an artistic way to give your home it’s own edge and sets the mood for the front entrance way of the home. Why not stencil yours on a large boulder at the edge of your lot and set it in a rock garden? Who says it has to be on the house! 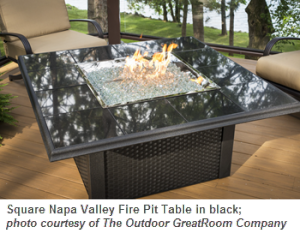 Fire pits are growing in popularity. Even though our summer days are warm, the nights can be cool. Adding a fire pit can bring family and friends together to create lasting memories. Pull up a chair, grab the marshmallows and tell some stories. With so many beautiful looks and ideas for fire pits and fire tables, there is one for each and every type of home out there. Our main supplier, The Outdoor GreatRoom Company provides high quality fire pits that surpass the others on the market and give the soft warm glow you’re after. They have free-standing models, fire tables, and tabletop units that work well in small areas. Fire pits can work on decks or patios. We also design and install custom fixed fire pits and outdoor fireplaces. Check out our Pinterest Fire Elements board for some inspiration. The biggest trend in gardening this year is to plant a garden that does double duty – provides attractive flowers and foliage, with something to eat later. Edible gardens help to sustain life; they help to provide for families. When you’re growing more than just flowers and plants inside your garden, you can ensure that you have a little more enjoyment out of having one. Growing tomatoes, cucumbers, lettuce and many other colorful treats in the yard is easy to do and rewarding. And you can even interplant veggies with flowers. In fact, certain flowers such as marigolds and nasturtiums help a produce garden thrive, because they repel pests. Bamboo is a strong material that doesn’t break easily. It can withstand the weather changes and looks beautiful in the yard, or even in the home. Using bamboo accessories throughout your yard means you do not have to replace them as fast, and they give the feeling of nature. Bamboo is a more sustainable alternative to other woods traditionally used for outdoor furniture, such as teak. Bamboo also can be used for fencing. Through the use of these new trends for 2015, your yard will be booming. With many different features that can be added, you’re easily able to enjoy the benefits of being one of the most attractive homes on the block. Don’t be caught without the latest backyard trends – now is the time to upgrade! Speak with us here at Architectural Landscape Design to find out how we can put together one of the hottest backyards 2015 has ever seen! We are a licensed residential and commercial landscaping design and installation contractor, serving the Minneapolis and St. Paul metro area, as well as outlying greater MN and western WI communities.